I took just 3 projects while I was traveling – a sweater (which isn’t very far along still), a shawl and a blanket. A blanket? That doesn’t seem like a good traveling project! Well, that’s true, but my blanket is made up of many many individual crocheted hexagons. So they were actually great for going around – the yarn didn’t take up a lot of room (two 100g skeins) and the individual pieces were easy to start and finish. Plus, I mailed the completed ones back home as I went! I’d made over half of the hexes in the last several (okay, many) months, but the deadline is approaching and I needed to step up my game. Of course, now I have to put the whole thing together! I’m not sure if it’ll be quite as big as I wanted, but it’ll be fine. I’m out of yarn, so it’d better be! The other main project I worked on was a shawl, out of two colours of Handmaiden Casbah. 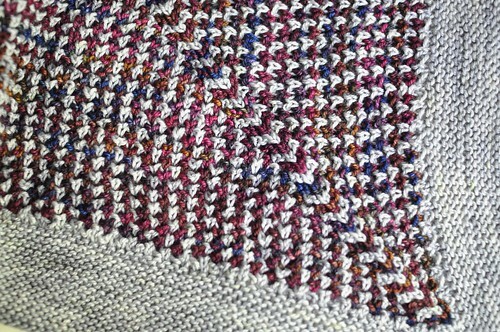 It really makes such a lovely fabric, and this texture stitch is easy and fun. I’m hoping to get this shawl pattern out to you soon – just have to find some time to block it and take photos. When I got home, I picked up a project that I started before I left, a pair of Conwy socks (from Knitting on the Road). I substituted my usual toe, not really on purpose but because I didn’t read the instructions very carefully! I made these as a birthday present for my dear friend Jane. I missed her birthday while I was away, so I wanted to give her something special! 1 skein of Socks that Rock lightweight in “Ruby Slippers”, 2.25mm needles. Fun! I’ve had tons of socks on the needles lately – they’re such nice comforting, soothing knitting. Wow! An impressive amount of work! I can never understand how people stay focused long enough to make blankets. Beautiful stuff! Pretty sure I have told everyone I know that I got socks for my birthday. They’re super special, and I can’t believe how well you made them fit. You’re a wizard. The hexagon piles picture is beautiful. The colors, the composition, love it. All three projects look awesome! I think I am close to convincing myself that I should learn to crochet. I am debating a hexagon blanket or possibly a ripple afghan down the road! Wow, that’s gorgeous. 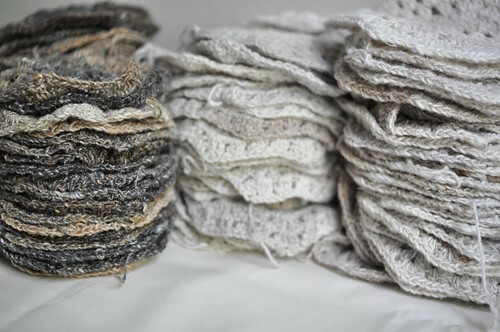 All those lovely neutrals. How much yarn did you use for the hexagons, if you don’t mind me asking? You said two 100 gram skeins, is that all you used, or just on your trip? I’m trying to get an idea of how much sock yarn I’d have to use to make one for us.